Last week’s strong performance and spike higher forf the euro vs dollar was clearly evidenced on the weekly forex chart ending as a wide spread up candle which saw the euro vs dollar briefly breach the USD1.30 level before closing marginally below. Given this strong performance on the weekly chart and with last week’s break and hold above the 14 week moving average this upwards momentum now seems to be gathering pace, and will be further confirmed should the 9 week moving average cross the 14 week thereby giving us a bull cross signal. 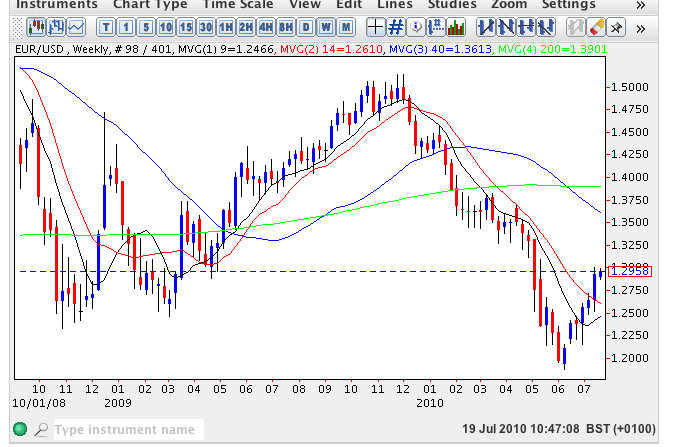 Whilst the longer term trend (as evidenced on the monthly chart) still remains bearish, the shorter term outlook looks positive for the euro, but the extent of any further rally is now questionable, as we begin to run into heavy price congestion at USD1.30 and beyond with the area between USD1.13018 and USD1.3580 perhaps being the most obstinate.